This article is about the green lithopod that shoots linear rocks. For the red one with homing boulders, see Decorated Cannon Beetle. For the paler lithopod that shoots harmless snowballs, see Arctic Cannon Larva. Armored Cannon Larvae (フタクチドックリ?, lit. : "Tokkuri Top-Mouth"; Armored Cannon Beetle Larva in Pikmin 2; Armoured Cannon Larva in the European version of Pikmin 3) are enemies in Pikmin 2 and Pikmin 3. They resemble large larvae with some of the similar Armored Cannon Beetle eyes and mouth. They act the same as the Armored Cannon Beetle, but turn and spit at a faster rate and have much less health. Their boulders roll in a straight line in Pikmin 2, but follow the terrain's curvature in Pikmin 3. They come in two types: one that walks around and one that burrows out of the ground; only the burrowing form is found in Pikmin 3. A related species called Decorated Cannon Beetles exists in larval form, in Pikmin 2, but the adults are not seen in any game so far. 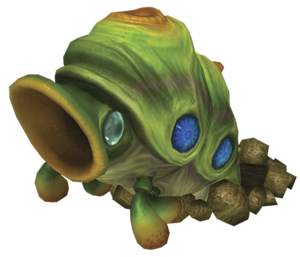 Like the adult Cannon Beetles, they have a blowhole on the top of their head, but it is either non-functional or not as powerful, so Pikmin cannot become stuck in it like with the fully grown beetles. Because Cannon Beetle Larvae lack the thick exoskeletal armor characteristic of the adult beetles, these enemies are vulnerable all over their body, but can buck the Pikmin off when attacked. They can be manipulated into destroying other creatures by making them spit boulders at a leader when they are beside an enemy. Moving out of the way before the rock hits them, the rock will hit the enemy that was behind. In Pikmin 2, the rocks that are shot out cannot be petrified, but they can, however, be destroyed if a Purple Pikmin is thrown on them. In addition, leaders can withstand a rock collision without suffering damage or knockback by lying down. At times, Armored Cannon Larvae might appear buried in the ground, instead of free-roaming. They will never unearth more than half of their body, and will not move from their spot. In Pikmin 2, a buried larva is internally recognized as a different enemy from the "normal" one. It has a lot more health than the walking counterpart. Due to what appears to be oversights, this buried version cannot be stunned by Purple Pikmin, and defeating it will not work for unlocking the Armored Cannon Larva entry on the Piklopedia. The game files indicate that the buried version has the same stun time and stun chance as the roaming one, so it is unknown why they cannot be stunned. ↑ The buried variant has 2000 HP instead. ↑ The buried variant recovers 6 HP per second instead. 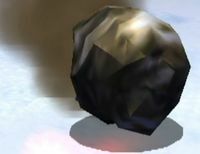 A boulder shot by an Armored Cannon Beetle Larva in Pikmin 2. The Armored Cannon Larva is a relatively stocky and slow creature. It wanders around aimlessly until confronted by a leader or a Pikmin, at which point it will take aim and fire a large boulder from its mouth. Though fast-moving, this boulder moves in a straight line, unlike those spat by the Decorated Cannon Beetle. The rocks crush any Pikmin caught underneath them and deal great damage to other enemies. When attacked, the creature will buck all Pikmin off with a very similar motion to the Fiery and Watery Blowhogs. Occasionally the Armored Cannon Larva is found buried in the ground, in which case it will halfway emerge when approached. Though this variation will not move, its attacks are identical to its walking counterpart. Additionally, it is sturdier, being unable to be stunned by Purple Pikmin and having significantly more health. The Armored Cannon Larva is very similar to its appearance in Pikmin 2. Notably, it now only appears in the ground, and its boulders are unable to crush Rock Pikmin, and strangely, Winged Pikmin. If enough Pikmin are available, swarm it and it should die before it can harm any Pikmin. If there aren't enough to do this or there are other factors that make this strategy ineffective, throw Pikmin onto it, preferably from behind. If the beetle bucks, call the Pikmin back as quickly as possible, repeat this process until the creature is defeated. If the larva is able to spit a rock, once it begins the animation, round up all the Pikmin you can and guide them out of the boulder's path using the swarm maneuver Another strategy is to throw Purple Pikmin on it, stunning it. It is a more effective strategy, but if no Purple Pikmin are available and/or if they shouldn't be risked, the first strategy is recommended. Alternatively, if you are placing a high priority on Pikmin life, then you can just use the leaders to deal with the creature. Punch it until it begins its bucking animation, then back away for a second, and return to attack. This may take a while but you will eventually defeat the creature by repeating this process. If two larvae are present in the same area, you can defeat them in a much more timely fashion by drawing one's aim over to the other, and having the rocks they spit do the killing. Approaching the creature with Rock Pikmin will work best, as they are immune to its crushing boulders. When it emerges, throw the Rocks quickly onto it. 20 direct hits will kill the creature. If no Rock Pikmin are available, then use a large army of preferably Red Pikmin to defeat the Cannon Beetle in a very short time by charging at it just after it emerges from the ground. If executed properly, the creature won't be able to attack even once. Note that Winged Pikmin are also immune to its boulders, in that they get knocked back instead of killed, making them effective at killing the creature. The creature's initial name, Armored Cannon Beetle Larva, is because of the fact that it is a larva of the Armored Cannon Beetle. That is the name the enemy has in the US and European regions of both Pikmin 2 and New Play Control! Pikmin 2. For Pikmin 3, the "Beetle" part was removed, and in addition, because of spelling, the word "Armored" became "Armoured" in the European version of the game. In Japan, they are called フタクチドックリ?, which is the same as the Armored Cannon Beetle's Japanese name. Their scientific name, Granitus chukkulinae, is the same as the Armored Cannon Beetle's scientific name. Internally, the free-roaming Armored Cannon Larva is identified as kabuto in Pikmin 2, which is the word used for an armor's helmet, while the buried variant is known as fkabuto – the letter f before an enemy's name is often used in Pikmin 2 to identify an alternate version of a normal enemy. In Pikmin 3, its internal name is futakuchi, which is the first part of its Japanese name. Futa Kuchi Dokkuri "Tokkuri Top-Mouth". "ふた?" means "top", and "口?" means "mouth". An image of the creature dead in Pikmin 2, as well as the back of it and it retreating if buried in both games. An Armored Cannon Larva shown from the Piklopedia. A burrowing Armored Cannon Larva in Glutton's Kitchen. The creature's e-card, #17 (7th yellow card). The only Armored Cannon Larva in the game's Story Mode. A dead Armored Canon Larva. Its movements are somewhat similar to grounded Blowhogs, as well as their bucking noise. The actions of the boulders spat out of the Armored Cannon Larva and Decorated Cannon Beetle resemble the actions of the green and red shells from the Mario Kart series. Green shells, when used, move straight forward, much like the green creature's Armored Cannon Larva's boulders. Red shells, when used, home in on the player in front, much like how the red Decorated Cannon Beetle's boulders home in on leaders. ↑ YouTube video showing how a free Armored Cannon Larva transformed into a buried one. ↑ YouTube video demonstrating how the glitched buried Larva can still get stunned. This page was last edited on March 15, 2019, at 16:58.